Simple, but effective, the AED Armor Wall Bracket provides you with the perfect storage solution for your life-saving investment, ensuring that the device is easily accessible and visible in the event of a cardiac emergency. Designed for use in indoor environments only, this wall bracket is a great option for public locations, such as schools, offices and shopping centres. The built-in strap ensures that your device is safe and secure when mounted and can be retrieved with ease in the event of a cardiac emergency. Why Do I Need a Wall Bracket? By storing your life-saving device in a Wall Bracket, you are increasing awareness and alerting everyone in your location to the presence of the AED. After someone has suffered a cardiac arrest, every second counts. Storing your defibrillator in a Wall Bracket helps to decrease the time between the patient collapsing and the treatment, providing them with a higher chance of survival. AED Armor has created a range of robust, eye-catching accessories that will help you make the most out of your life-saving investment. Each and every accessory from the AED Armor range has been designed and created to the highest of standards, ensuring your AED is safe, secure and easily retrievable in the event of an emergency. 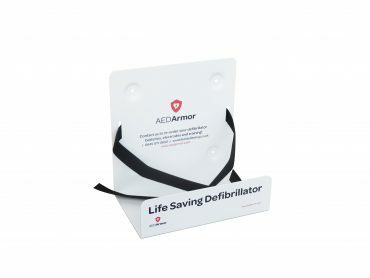 If you require further information about this product, or any other product from the AED Armor range, the AED Armor team are the ones to call. To speak to one of our advisors, call 0333 678 0246.